We are in an era of progress paradoxes. Unprecedented gains in technological innovation, poverty reduction, and life expectancy around the world coexist with persistent poverty traps in the poorest countries and increasing inequality and anomie in some of the wealthiest ones. In the U.S., one of the wealthiest countries, we see booming stock markets and record low levels of unemployment alongside stories of profoundly unequal hopes, lives, and lifespans. An important driver of these inequalities is the decline in the status and wages of low-skilled labor at the same time that high-skilled workers have experienced increases. Relatedly, we have seen an increase in prime-age males (ages 25-54)—and, to a lesser extent, women—simply dropping out of the labor force: Fifteen percent have already dropped out and this number will likely increase to over 20 percent in the next few years. Yet despite their increasing numbers, these individuals fall out of the calculation of unemployment rate when they stop looking for work. Meanwhile, U.S. life expectancy is falling due to suicides and drug and alcohol overdose (“deaths of despair”), primarily among less-than-college-educated whites in their middle-aged years. Out of the labor force (OLF) males are more likely than the average to be opioid users and on the disability rolls, as well as victim to deaths of despair. Our markers of well-being—and in particular the absence of hope—match the patterns in these deaths. Poor and working-class whites report much less hope for the future and more stress than do poor African Americans and Hispanics, even though the latter face higher objective disadvantages. And the same places that have higher levels of these kinds of deaths have lower average levels of well-being along the same dimensions. In addition to tragically lost lives and human potential, these trends have political ramifications. Prime-aged males OLF are more likely to live in counties that voted for Trump in 2016. And while the trends may be most notable in the U.S., there is frustration among this same cohort in Europe, reflected in the rise of support for right-wing populists there. In a new paper, we look to shed light on the unhappiness and frustration of this understudied group across several regions as a first step to seeking solutions. We examine prime-age males OLF across four regions: EU, Latin America and the Caribbean (LAC), MENA, and the U.S., based on data from the Gallup World Poll from 2010-17. Our analysis provides a more nuanced picture of the well-being and ill-being of prime-age males OLF around the world than the common narrative suggests. OLF males are not the poorest group in any of these regions, and are closer to the low, vulnerable end of the middle-class in their locales. While their household incomes are below the average for their countries, they are often slightly higher than those of the unemployed. In the developing regions of LAC and MENA, individuals who report to be out of the labor force may also work in the informal sector and earn comparable incomes to the formal sector, though with more unpredictability. In the U.S., OLF males are often on disability or other social insurance programs, while in Europe there are widely available and generous social welfare programs. 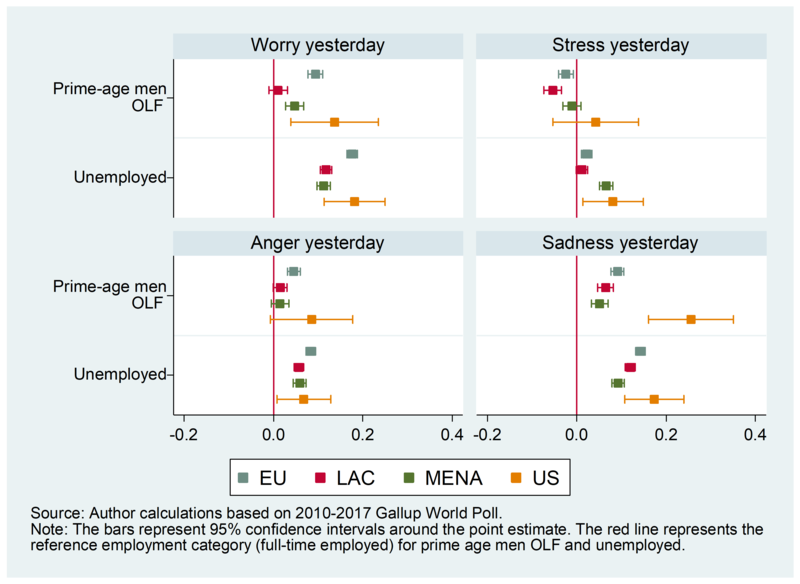 And despite much discussion suggesting that poor life satisfaction among underemployed or unemployed men in the Middle East was a possible catalyst for insurgency and uprisings, our analysis does not find them to be particularly dissatisfied compared to the full-time employed, relative to what we find within other regions. This may have something to do with longer trajectory and social acceptance of male underemployment and unemployment in MENA, compared to the U.S. and the EU, where it is a relatively novel phenomenon. It is also noteworthy that while prime-aged males OLF across all regions typically fare worse than the other out-of-the-labor-force groups, the unemployed often tend to have even lower well-being. The exception is the U.S., where prime-aged males OLF are a particularly troubled group, not only in health but also in terms of reported well-being and of markers of ill-being. Within the country, they are as unhappy as the unemployed and much less optimistic than either the unemployed or full-time employed. Unlike in the other regions, they are just as likely to report anger and sadness than the unemployed, and no more likely to smile or experience enjoyment. Relative to other regions, they typically have the largest well-being gaps relative to those who work full-time. 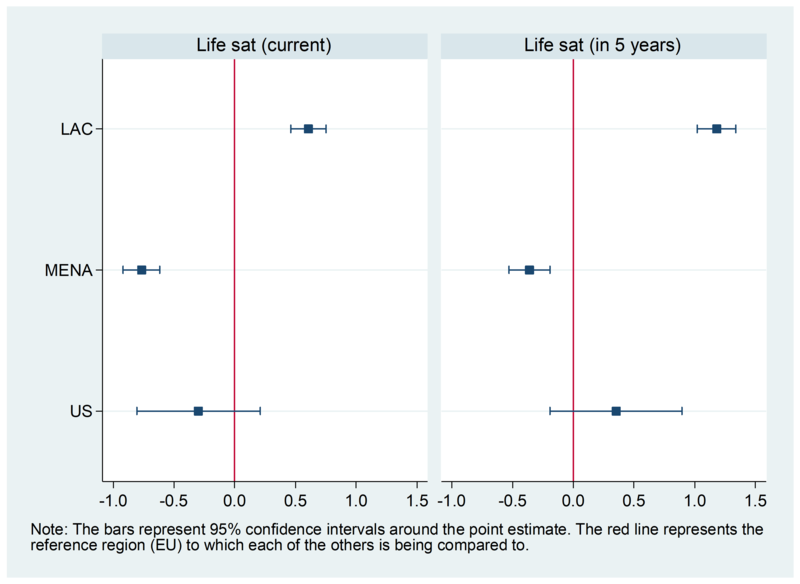 When comparing the absolute levels of well-being of prime-age males OLF across regions, the well-being profile of U.S. males is only slightly above that of those in MENA, a region where absolute levels of wellbeing for all demographic cohorts are significantly lower than those in the U.S., EU, or LAC. 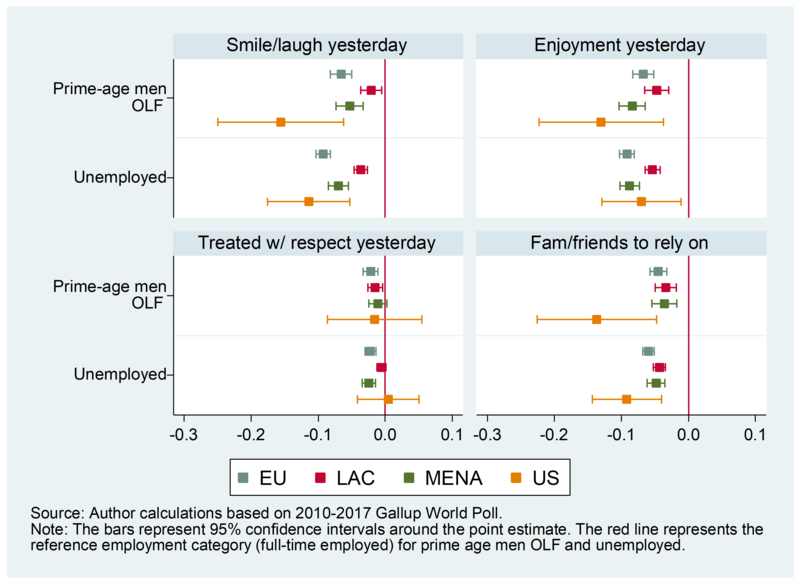 We find that those in MENA (and, for the most part, also in the U.S.) have particularly low levels of well-being for the dimensions highlighted above: evaluative, negative affect, and positive affect. 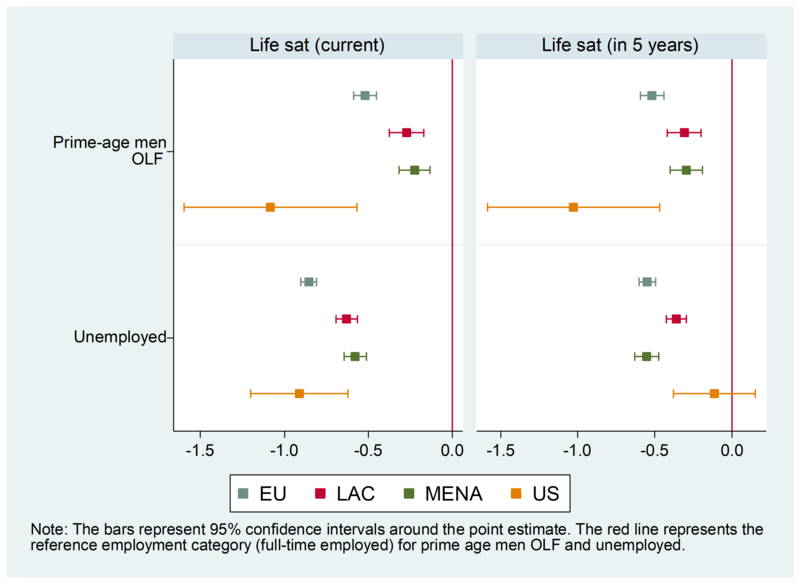 Yet in MENA, there are relatively small differences in well-being between prime-age males OLF and those employed full-time; both groups have low well-being levels to begin with—as does the average respondent. In contrast, in the U.S., prime-age males OLF have both low absolute well-being levels and wider gaps when compared with other employment categories, fitting the broader trend of a group that is in deep despair. It is important to highlight the historical lack of labor market opportunities for most groups in some MENA countries compared to the newer trend of labor force dropout—and the stigma associated with it—in the U.S. While Latin America has also historically had weak formal labor markets, those are countered by widespread informal employment as well as high levels of well-being relative to the region’s per capita income. In the U.S., the strong individual work ethic and lack of support for collective safety nets that characterize the American dream contribute to the strong stigma of being out of the labor force. Prior to the decline of the manufacturing sector, working class whites had privileged access to the jobs therein and to stable middle-class lives that came with them. When those jobs declined, so did the life narrative of these workers, as well as their relative status compared to minorities and immigrants. In contrast, minorities, who had a much longer trajectory of coping with adversity and of multi-tasking in order to survive, continue to display higher levels of resilience. Another part of the narrative of white working class—strong marriages and religiosity—has also suffered. Marriage rates and civic and religious participation have fallen more for the working class relative to the college educated since the 1970s, in part related to labor force dropout. Trends in optimism for less-than-college-educated males also began to fall relative to women and African Americans during the same period, an early precursor to the trends in premature mortality. As a parallel to these trends, belief in the American dream and in the rewards to higher education fell at the same time that it remained strong for African Americans and Hispanics. There is much more to learn about these worrisome declines in labor force participation and the associated ill-being that comes with them. While the problem is starkest among U.S. prime-age males, all four of these regions will continue to face the challenges that technology-driven growth poses for low-skilled workers. There are some lessons about the kinds of policies that can encourage the participation of low-skilled workers in the new global economy from economic renovations in some small cities in the U.S. heartland. There is also a growing literature based on interventions that enhance the well-being of those who can no longer work via new opportunities for community involvement and other forms of activities to prevent social isolation. More generally, our findings suggest a broader need to re-think our models of growth and indicators of progress.